This extensive retreat is focused on nondual Self-Knowledge as revealed by Sri Ramana Maharshi and consists of in-depth commentary, with dialogue, upon the teachings contained in Sri Ramana Maharshi’s Saddarshanam (i.e., Sat-Darshanam, Truth Revealed, Forty Verses on Reality). There is also much time for the participants to silently meditate upon this quintessential, profound Knowledge during these five days of blissful Wisdom and the revelation of the Truth within you. 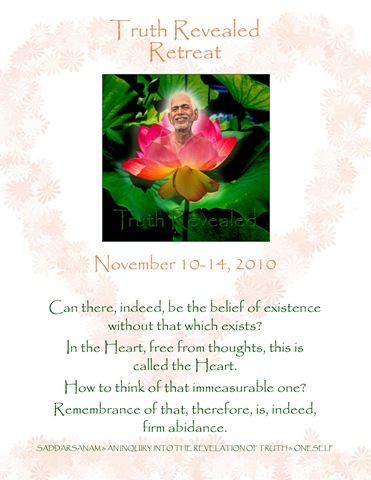 If you would like to attend this retreat, please visit the SAT Temple website at: <satramana.org>, RETREATS, print the application, fill it out and return it to SAT along with your payment no later than November 3, 2010. Technorati Tags: Society of Abidance in Truth,Self-Knowledge,Advaita Vedanta,Sri Ramana Maharshi,Master Nome,Ribhu Gita,Siva,Enlightenment,SAT Temple,Satsang,Upanishads,Self-Realization,Self-Enquiry,Devotion,Jnana,Ajata,Saddarsanam,Truth Revealed Retreat,Who Am I?